A new content marketing guide is available that details 3 phases of the content marketing process: planning, implementation, and measurement. Both business-to-business (B2B) and business-to-consumer (B2C) content marketing scenarios were considered. Numerous content marketing examples and resources are provided. The Guide starts with the premise that content marketing is the hottest topic in all of marketing. Why? Because according to a 2016 study by the Content Marketing Institute and MarketingProfs, 88% of B2B marketers and 76% of B2C marketers are using content marketing. The content planning phase includes defining objectives, determining content topics, and identifying content types or tactics. Regarding tactics, the aforementioned studies identified both B2B and B2C content tactics in the charts below. No question, there are major differences in content types depending on business or consumer targets. That said, social media content is the most used for both scenarios. Surely the social networks are different with LinkedIn being tops for B2B, and Facebook for B2C. Besides social media, B2B marketers use case studies, blogs and e-newsletters, along with many other content types (at high percentage levels). B2C marketers use photos and illustrations, e-newsletters, videos, and again, many other content types (at lower percentage levels). Ok, so there are many types of content. But when it comes to planning, how do you determine what content types to focus on? This will be specific to your brand and target audience needs. Most pundits recommend using multiple channels, and re-purposing content for different channels to ensure targets actually see your content, or consume content in their preferred channel. Yet another consideration is that blogging can be a content engine that is distributed via social media, and used as feedstock for emails, white papers and e-books. But again, this depends on your unique marketing scenario. The next phase, content implementation is separated by B2B and B2C scenarios. 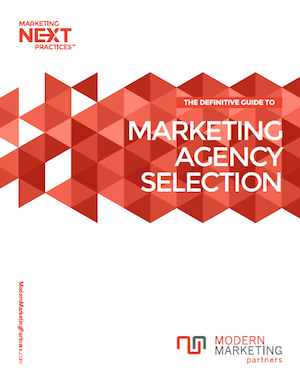 To download the complete Content Marketing Guide, link here. Take a look at what experts like MarketingProfs, and the American Marketing Association are talking about. Content is at the forefront. Not because it is a shiny new strategy, because it is not new. Content is critical to marketing because it achieves measurable results! Websites and blogging are important, and both depend on content. Social media continues to grow in importance, and depends on content. Search engine authority is improved by excellent content. Content drives lead generation and even sales. The phrase “Content is King” has never been more true! To download the complete Content Marketing Guide, link here. For a free Content Marketing Program consultation, contact Modern Marketing Partners.